Regular readers of the `Roundabout` will have gleaned by now that I enjoy my tucker when I am out and about tramping the hills of Northumberland. It is almost a routine. Up with the larks, a couple of hours of brisk walking, a quiet out-of-the way spot high on some hillside, preferably with a breathtaking panorama, and then lunch, more often than not consisting of peanut butter sandwiches. Not exactly `cordon bleu` but quick and easy to make and packed full of protein. Add a few pieces of `Kendal Mint Cake` and a high energy drink to the mix and it has a similar effect to rocket fuel. Well, that is the theory! Gather together a group of like-minded walking individuals and picnics will inevitably become a hot topic of conversation. Every Gortex-clad outdoor type will undoubtedly have their own view as to the perfect place to while away 15 minutes or so enjoying the culinary delights of their bait box, the nutritional value of which may have taken them weeks to plan. The room for disagreement between walkers is vast even before the discussion moves on to the pros and cons of the various types of food each person likes to munch at. Heated arguments might even ensue as the tempers of tired walkers become frayed at the edges. We all have our personal preferences. Take for instance W. Ford Robertson who, in his 1926 published book, `Walks from Wooler`, offered some good advice on what to pack for a day out in the hills. He advised would-be walkers that, “on the whole, it is best to leave the kettle behind”, suggesting instead a vacuum flask filled, “with hot milk, coffee, cocoa or tea”. On turning to the thorny subject of what to eat during a walk, he thought that some people might prefer, “certain concentrated forms of food”, such as, “raisins and almonds, dates, ordinary chocolate and sanatogen chocolate”. Over the past 12 months I have enjoyed some tremendous picnic spots far from the maddening crowds, places I would be happy to return to time and time again. I have stood and eaten my sandwiches high above the River Breamish surround by snowfields the like of which Northumberland had not seen in a generation. I have sat with my back to the warm September rock on West Hill overlooking the magnificent cleft of the Hen Hole with the shimmering thread of the College Burn picking a way through the boulder strewn valley floor. 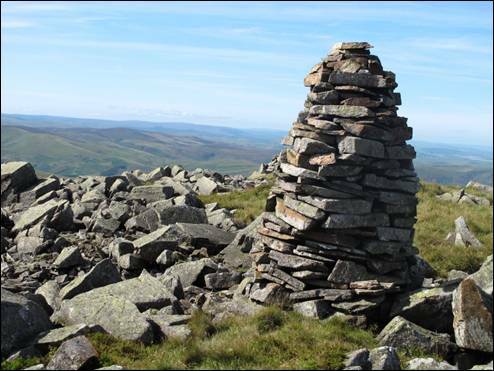 I have sheltered from the wind behind the impressive cairn on Blackhaggs Rigg enjoying eye-popping views of the dark north facing side of The Cheviot whilst watching the clouds race across a busy sky pursued by an over-energetic March wind. I have dilly-dallied amongst the substantial ramparts of the Iron Age hillfort on the summit of Woden Law sipping the remnants of my high energy drink beneath a curtain of cloud drawn across a reticent Cheviot sky. It is funny how the simple things in life can make such an ordinary packed lunch seem so incredibly tasty. Now where can I buy some `sanatogen chocolate?